A collection of vivid sapphire engagement rings, styled with expertly faceted richly coloured blue, pink and green sapphires, combined with dazzling white diamonds. The Tickled Blue engagement ring dazzles with an ice blue Aquamarine edged by a graduated set of brilliant cut diamonds. Featuring a natural pale Blue Aquamarine, this spectacular design features curved twist shoulders and refined elegance. The Starla blue Sapphire and diamond halo engagement ring features a solitaire effect cluster of intense blue sapphires, surrounded by a circle of gleaming white diamonds, styled in a wedding ring friendly ring design. Central solitaire effect cluster of blue sapphires. Natural diamond halo surround featuring round brilliant cut diamonds. 0.33 carats total gemstone weight including diamonds and blue sapphires. Some specifications available from stock - contact us for more details and the possibility of fast delivery. The Tickled Pink engagement ring bursts with an intense pink sapphire, bordered by a graduated set of brilliant cut diamonds. Set with a natural vibrant pink sapphire, this spectacular design features curved twist shoulders and refined elegance. 5mm Pink Sapphire. Graduated F colour VS clarity diamonds. 0.10cts total diamond weight. Twist shoulders and a court profile band. Please allow 3-4 weeks for delivery. Wood boxed and gift packaged. The pink sapphire and diamond bubble ring, beautifully combines natural pink sapphires with ice white diamonds in this exceptional ring design. Set with a combination of 0.25cts or round brilliant cut diamonds, with natural pink sapphires, this delightful ring holds 0.75cts of pink sapphires, captured in full bezel settings in a unique bubble design. Exquisitely crafted blue sapphire and white diamond 5 stone ring with court profile and claw setting. Five brilliant cut stones. 3 x 5.0mm blue sapphires. 2 x 5.0mm round brilliant cut diamonds. Total diamond weight 1.00cts. Total combined carat weight exceeds 2.50cts. 2.5mm wide band. Wood boxed. Gift packaged. 3 weeks delivery. Contemporary seven stone pink sapphire and white diamond ring with three band design. Beautiful contemporary ring. A combination of deep pink sapphires across a three band design with beautifully cut white diamonds. Full bezel settings and a total diamond weight of 0.40cts to compliment the pink sapphires. See RLD008 our blue version for the animation of this design. Enjoy the beauty of the three stone blue sapphire and diamond engagement ring. Featuring an intense Blue Sapphire with outer Princess cut diamonds within an elegant Trilogy three stone ring design. Trilogy design. Central oval blue sapphire. Outer Princess cut diamonds. Central 7 x 5mm oval blue sapphire. Outer 3mm princess cut diamonds. Exceeds 1ct total weight. Wedding ring fit. 0.30cts diamond weight. G colour SI1 clarity. Wood boxed. Gift packaged. 3 weeks delivery. An exceptional pink sapphire and diamond halo engagement ring, featuring a vibrant pink sapphire encircled by pristine white dazzling diamonds. A four-claw set blue sapphire and grain set diamond shoulders engagement ring. A five stone diamond engagement ring featuring natural pale pink sapphires, accenting the central white diamond 0.50cts diamond centre in a twist design. Fully certified centre diamond. Choice of clarity grade. Very Good cut assurance. 18ct White Gold. Platinum available upon request. Natural pink sapphires weight an additional 0.08cts. Please allow 3 weeks for delivery. Blue Sapphire Engagement Ring with Diamond Shoulders 18ct White Gold. 5.8mm round brilliant cut blue sapphire. 0.70cts sapphire weight. Four claw setting. 0.21cts round brilliant cut diamonds in a channel setting. G colour VS1 clarity. Wood boxed and gift packaged. Please allow just one week for delivery. Vintage styled compass set, engagement ring holding a 5mm Pink sapphire and 0.21cts of G Colour VS Clarity diamonds in the shoulders 5mm Round brilliant cut Pink Sapphire with 0.21cts of round diamonds in shoulders. Please allow 1 week for delivery. This specific ring mount is finger size L1/2. Round pink sapphire diamond solitaire ring, with white round brilliant cut channel set diamond shoulders. Central pink sapphire weighing approx. 0.57cts and measuring 5mm in diameter. Additional 0.21cts of beautiful white channel set diamonds across the shoulders. Exceptionally pretty design, which takes around 3-4 weeks to manufacture to your size and metal choice. Packaged as shown in our example. Pink Sapphire and diamond halo engagement ring with plain shoulders, diamond cut pink sapphire, diamond halo and wedding ring friendly fit. Round brilliant cut natural Pink Sapphire. 5mm diameter. Outer halo of fully round brilliant cut diamonds 0.16cts in diamond weight. F colour VS clarity. 18ct White Gold or Platinum. Please allow 3-4 weeks for delivery of this item. Wood boxed and packaged. A square pink sapphire and diamond engagement ring, set with a vivid princess cut pink sapphire, with princess cut diamond shoulders. Set with an exceptionally vivid 5mm princess cut pink sapphire weighing 0.75cts. This design reveals a 4 claw setting and has channel set diamond shoulders. The diamond shoulders have a 0.25 carat weight and are hand matched in F colour and VS1 clarity to contrast with the pink sapphire. Please allow 3-4 weeks for this design. Beautifully packaged as shown below. 4 claw round brilliant cut diamond solitaire ring, with the addition of alternating pink sapphire and diamond shoulders within a channel setting. Certified central diamond. Very good cut grade. 4 claw setting. Alternating diamond and pink sapphire shoulders. Each shoulder stone is 1.5mm in diameter. Shoulder stones weigh a total of 0.25cts in addition to your chosen central diamond. Round solitaire pink sapphire engagement ring with diamond and pink sapphire shoulders. Central pink sapphire. Round brilliant cut. 5mm diameter. Four claw setting. Diamond and pink sapphire shoulders with channel setting. Shoulders contain approx. 0.10cts diamonds and 0.21cts of pink sapphires. Antique 6 claw diamond engagement ring with milgrain and engraved diamond shoulders. 5mm Pink sapphire, set within 6 claw vintage style engagement ring, Created in 18ct White Gold, Size M. 1 week to 10 days delivery. Gift packaged and Wood boxed. A delicate flower cluster created with six pink sapphires surrounding a central diamonds with diamond set shoulders. Enjoy the perfection from this adorable pink sapphire and diamond square halo engagement ring. Just one design from our petite collection, this affordable pink sapphire engagement ring makes a refreshing change from the all-diamond ring styles within the Serendipity Diamonds collection. Styled with a central pink sapphire, above a halo surround of diamonds, and flourished with sparkling white round brilliant cut diamonds. Many of our sapphires originate from Sri-Lanka. 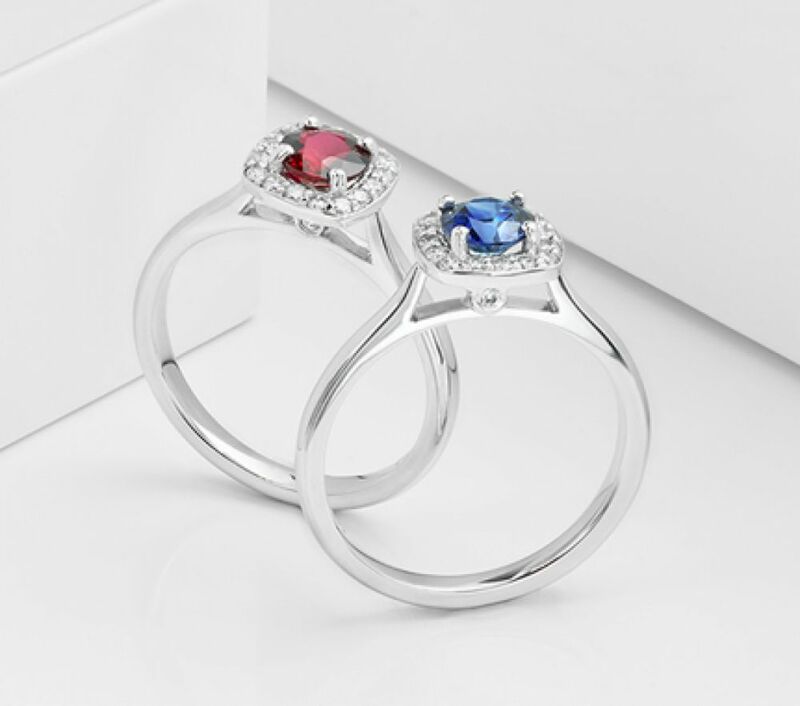 From the mine to the faceted gemstone, our blue and pink sapphires are available in a wide range of shades including pale blue, cornflower blue, Ceylon, baby pink, candyfloss pink, and pink-purple. Selected clarity grades are always kept at eyeclean, to ensure maximum brilliance and clarity. Mixed with dazzling white diamonds, contrast is achieved through beautifully cut side stones and shoulder diamonds, styled into Platinum, White Gold, Yellow Gold and Rose Gold settings. Fairtrade Gold is our 100% ethical option available for most ring designs. In addition to the most popular sapphire colours, our UK workshop now creates engagement rings with green sapphires via our custom made engagement ring service. We can also match sapphire wedding rings to create the perfect bridal set matching to your original engagement ring design.